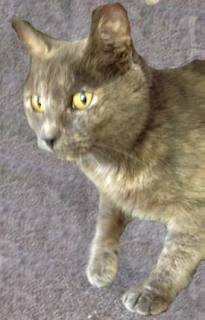 Hearts to the Rescue: Nassau County, Long Island * LILLY*LOST her HOME after Storm IRENE. Wonderful Seniors have been feeding her...they can no longer care for her due to the RULES of the CENTER!!! LILLY needs a HOME or FOSTER QUICKLY As in NOW. Nassau County, Long Island * LILLY*LOST her HOME after Storm IRENE. Wonderful Seniors have been feeding her...they can no longer care for her due to the RULES of the CENTER!!! LILLY needs a HOME or FOSTER QUICKLY As in NOW. Lilly is a stunningly beautiful petite tortoiseshell cat that is about 2 years old and weighs 7 pounds. She is without a doubt the most affectionate cat we have ever rescued. She loves people and purrs non-stop when she is held. She is great with other cats and, when she is not busy charming everyone in the room with her playful antics, kneads herself to sleep. Lilly was an owned cat until Hurricane Irene when she got lost and found herself begging for food at a senior center in Nassau County. The wonderful seniors were very fond of Lilly and made sure that she got fed every day, but asked us to take her because each time they opened their front door Lilly would try to run into the apartment and, while they would all love to keep her, pets are not allowed at the center. This cat was obviously treated well her whole life and just needs a loving family that will give her a FOREVER home. Please give her a chance you definitely won’t regret it! Lilly was just given a clean bill of health by a veterinarian. She is spayed, has had all of her shots, been dewormed, tested negative for FELV and positive for FIV.